Dungeons & Dragons’ lead rules designer Jeremy Crawford has a tough job. To keep the game in top form, he’s got to make sure its exhaustive ruleset walks that fine line between combat and role-play, thoroughness and accessibility, firmness and flexibility. Along the way, he’s come up with some good tips on getting in touch with D&D’s system. D&D’s rules are a kinetic thing, and in the hands of players and their dungeon master, more kinetic still. Everything is up for interpretation—sometimes, the rules even say so. Occasionally, the rules can use some helping-along with outside tools and unintuitive strategies. And as a lot of players know, sometimes following the rules isn’t even the right thing to do. 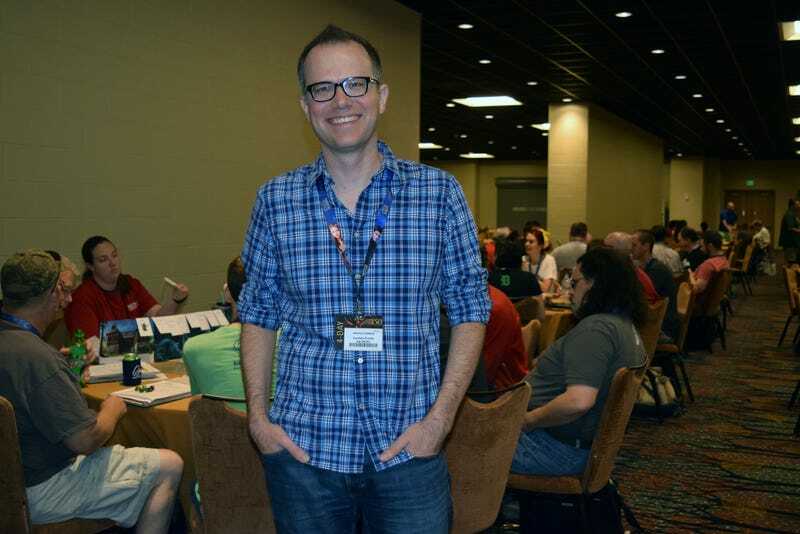 At Indianapolis tabletop convention Gen Con, Crawford helped guide Kotaku through his favorite forgotten D&D rules, hacks, and add-ons for fresh players and veterans alike. Re-jigger ability roles to fit what your character is good at. A small and hidden rule in the Player’s Handbook cracks open party roles so players stop getting pigeon-holed: mix-and-matching ability scores and skills you’re proficient in. “A lot of people think, for instance, ‘Oh, whenever I use Persuasion, it’s always paired with Charisma,” Crawford said. But in fact, he said,, there’s a variant rule that lets players pair any skill they’re proficient in with any ability score, depending on what’s happening in the story. “If somebody, for instance, is trying to persuade somebody, they can do it with a kind of acrobatics routine. I might say, all right, give me a Dexterity/Persuasion check,” Crawford explained. Players, he said, can just add their ‘Proficiency’ bonus to whatever ability bonus is relevant to what they’re trying to do. This opens up characters who might not typically be persuasive to taking the lead in those scenarios.Perhaps highly charismatic characters could talk their way through a successful sleight of hand, which would typically be a Dexterity check, not Charisma. To keep combat moving along, hang Initiative markers on your Dungeon Master’s screen. If you’ve ever seen an Adventurer’s League dungeon master hang bits of paper over the top of their dungeon master’s screen, you know this hack. Initiative sequences can get clogged, and a lot of the time, that’s because players aren’t paying attention or don’t know when it’s their turn to fight. Fold a piece of paper in half with each person’s name on it, along with each of the monster groups. “The player-facing side can have players’ names, but on the DM’s side, [players’] passive perception and armor class,” Crawford adds. My setup for a Dungeons & Dragons game includes a pencil, a notebook, a Player’s Handbook, a Monster’s Manual, the adventure in question, and my dice. Not very high-tech. When I prepare for a campaign, I’ll use a word processor. It’s not a very organized way of doing things. Crawford suggests using Microsoft OneNote, a note-taking app available on Mac, PC, iPhone, iPad and Android that stores notes in the cloud. That way, any time you have an idea for your campaign or character, you can jot it down and view it anywhere. Also it’s easy to add sections, pictures and shortcuts there, too, for maximum organization. Weed out problem players before they become a problem. Okay, so this isn’t exactly a rule, but it’s definitely a helpful guideline. Sometimes, you’re stuck with players who aren’t fun to play with. D&D is supposed to be fun. That means you’ve got a problem. And the solution to the problem is to impose a sort of “trial period” on unknown quantities. When in doubt, Dodge it out. Hiding in the Dungeon Master’s Guide is a tip for cutting down on excessive rolls before combat: “Just assume every monster rolled a 10 on the d20 and make their initiative 10 plus their dexterity modifier,” Crawford said. He and his colleagues over at publisher Wizards of the Coast even considered adding that base initiative score to each monster’s entry in the Monster Manual. Backgrounds are for “spice,” not hard and fast rules. When making a character, it’s tempting to go by-the-book in all aspects, including guidelines for that character’s backstory. With 5th edition’s introduction of “Backgrounds,” specific backstories that add proficiencies and grant items, I’ve noticed a lot of players cramming their story ideas into some pretty restrictive stereotypes so they “qualify” for those bonuses. How about simply not doing that? Watch out for players who want to be evil. The bottom line when it comes to adding evil players to the party is maybe don’t. If a player is dead set on it, and the dungeon master believes they can role-play responsibly and not derail the game, Crawford recommends reminding players that “even bad guys need to have friends, or at least allies they can exploit. I caution people who play evil characters against screwing over their friends too much.” He also noted that it’s good for the dungeon master to ensure there’s a common purpose among the whole group, or at least relatively adjacent individual goals. When I’m DMing, I often spend just as long preparing for a game as my players do playing it. And, yeah, that has definitely led to burnout. Crawford has a rule for this: “Preparation for any individual session should take no longer than half that session’s length.” Also, to cut down on future preparation time, DMs should recycle aspects of the game players heedlessly skip over in their rush to advance the story or raid the orc den. “I try to make it so that none of my preparation goes to waste,” Crawford adds.